Breaking news just in to the Pirated Thoughts news desk. A jury has determined that the look of a skull head alcohol bottle is protected trade dress. Globefill Inc. is the owner of Crystal Head vodka that has been sold throughout the United States since 2008. In association with the bottle the company owns a registered trademark for the non-functional aspects of the bottle, mainly the skeleton face. Comedian/actor Dan Aykroyd has been a pitch man for the company and has some ownership stake in the business. 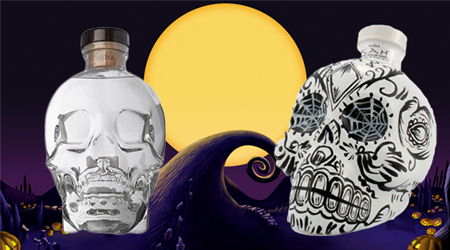 Elements Spirits, Inc. is the owner of KAH Tequila that in 2010 began distributing its tequila in a skull shaped bottle as well. Crystal Head on left, KAH on right. In 2010, Globefill sued Elements for trademark infringement claiming that the KAH bottle was confusingly similar to the Crystal Head trademark. Fast forward through years of discovery and eventually a trial was held and a jury found in Elements’ favor and against the claims of infringement. Globefill filed a motion for a new trial and appealed the jury decision and last week it got a pleasant surprise. Three presiding judges at the Appeals Court reversed the decision not to grant Globefill a new trial. According to the court, Elements had improperly referenced a similar case being held in Mexico over the skull bottles. Globefill contends that Elements told the jury Globefill admitted to a Mexican official that the bottles were not confusingly similar. Regarding this statement, the court held that Elements had misrepresented the contents of a document and falsely implied that Globefill deliberately concealed documents from the jury. Although limited to the closing argument, the court reasoned that this misconduct sufficiently permeated the entire proceeding and granted Globefill a new trial. There was a new trial and now a decision. After four hours of deliberation, a jury found in favor of Crystal Head vodka and finding that KAH has committed trademark infringement of the look of the bottle. The jury found that the look of KAH was likely to confuse consumers to think the two brands are associated, when they are not. The trial lasted three weeks and saw Dan Aykroyd take the stand. While the jury determined that there was infringement, it did not decide a dollar value to be awarded to Crystal Head. That decision will be made in the future, after the judge tries out all the evidence, I’m sure.